The Best American Essays of 2004.
a feathered cannonball fanning a leaf-ripping tail. checking under cushions for coins. but didn't want to spoil the magic by staying too long. I navigated tangled stalks like woody barbed wire. Finally, a boulder ramp led me down to a clearing. I couldn't sense any better than from above. half-hopping on clownish chicken feet to catch up. then eye-balled me with an orange intensity. of being in charge, yet being in love. Could this bird really be my late mother? to honor her passion as an Audubon birder. Did I unwittingly plant the seed for her return? for some unfathomable reason, to my cousin, Muggsie. This grouse clearly knew what she wanted. Softly she cooed and finally winked. eager to talk no matter what we happened to say. to prance close to my boots, cocky as a city pigeon. her feathered crest sharpened her head. every few steps to nip at a blueberry flower. cooing, content. Was that what she wanted? Behind my back, she pecked at my daypack zipper. under the Wildlife Protection Act? Did she know how rarely I swept? No, I needed to end this strange encounter. I stood and shouldered my pack, nodded good-bye. But giant steps up the rock didn't do any good. for me to catch up. How could I shake her? 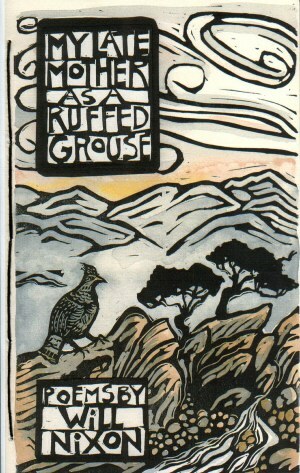 but she didn't act disappointed in me as a grouse. She waited and cooed with encouragement. did she stop at the edge of her laurel protectorate. in the bushes I couldn't avoid to hike home. is an 88 page hand-stitched paper book with spine.